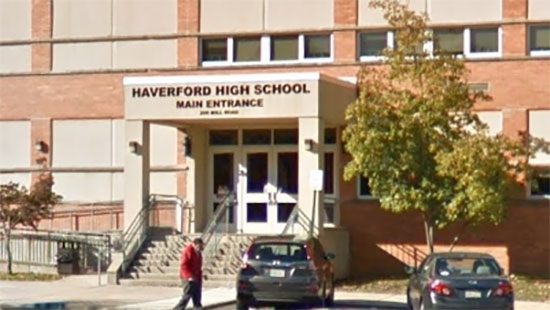 Haverford High School was evacuated this afternoon after graffiti referring an explosive device was found on a school wall. The school district says that Haverford Police searched the building and found no credible threat. Evening activities will go on as planned. Students can come back to school and retrieve their book bags before 7:00 p.m. Earlier today around 3 p.m. he school had tweeted, "Out of an over-abundance of caution, the students were dismissed, the building was evacuated and the police are completing an investigation of the premises. Once this has concluded and the police have decided it is safe, evening activities will resume as scheduled." No one was injured. The principal of Haverford Middle School in Havertown, Delaware County, has warned parents that students may have been exposed to whooping cough or pertussis. Daniel Horan sent an e-mail to parents saying that children may have been exposed to a case of the disease at the school. "Sometimes a child can get sick with pertussis after being around someone with the illness. This is especially true when the child has not received all of his/her pertussis vaccinations," Horan wrote in the email. It is highly contagious and can spread through the air from sneezes and coughs. Symptoms start as a cold and cough. If they get worse, see a doctor. Philadelphia City Councilman Bill Greenlee introduced a bill on Tuesday, 2/5, that would ban cashless stores in the city. Those stores, such as eatery sweetgreen, have gone cashless in favor of pay-by-card or pay-by-app. The biggest reason for ditching coin and paper is convenience and speed of service. It also reduces robberies and improves hygiene from passing bills. Councilman Greenlee and others argue that the cashless policy is discriminatory against the poor. The poor are less likely to have a bank account, credit/debit card, or access to a phone app to make a purchase at these stores. Doylestown-native Pink, aka Alecia Moore, was honored on Tuesday, 2/5, with her very own star on the Hollywood Walk of Fame in Los Angeles. Pink's career as a singer, songwriter, dancer, and actress has lasted over 20 years. She's been nominated for and won countless awards for her music around the world. Pink has also been active in charitable work throughout her career. She is married to motocross Carey Hart and they have two children. "There's a power in making a decision that while you may not be the best that ever did it, you may not be the prettiest, or the tallest, or the funniest, or the most talented, or whatever else you might tell yourself your not, but if your stubborn and you don't give up and you work really hard no one else can ever be you," said Pink. Philadelphia Eagles QB Nick Foles informed the team that he will opt out of the mutual option picked up by the team for the 2019 season. The option picked up by the Eagles was worth $20 million to Foles. He had to pay $2 million to opt out. The Eagles could now place the franchise tag on the 30-year-old, which would be worth $25 million. Otherwise, the Super Bowl LII MVP will become a free agent.